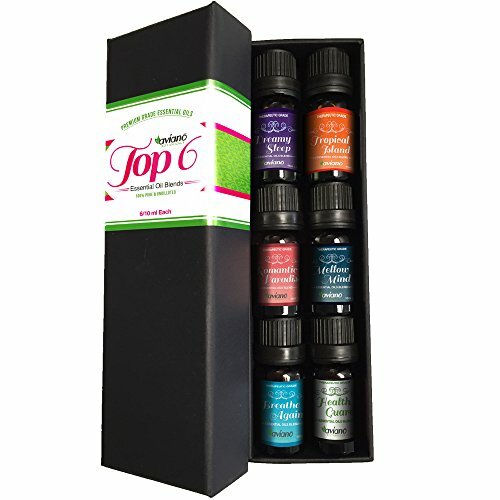 This Top 6 Aromatherapy Essential Oils Gift Set by Aviano Botanicals is best for both beginners and advanced users alike. There are 6 distinguished and very lavish smelling essential oil blends within this set which are sure to put a smile on anyone's face! This set consists of therapeutic grade 100% natural essential oils which are cultivated and produced from throughout the world and then bottled for you and your family's pleasure and well-being. It makes a great gift to give or to keep for yourself. 100% Satisfaction Guaranteed! This set consists of 6 10ml bottles of the following blends with the following ingredients in each... ? Dreamy Sleep: Lavender, Chamomile, Clary Sage, Mandarin, Ylang Ylang, Cedarwood, Orange, Petitgrain --- Great for when about to or wanting to sleep or when sleeping. ? Tropical Island: Orange, Lemon, Grapefruit, Bergamot, Thyme, Mandarin, Clary Sage --- Take a whiff of this and you will do the happy dance as you are whisked away to smell the tropical scent of paradise. ? Romantic Paradise: Lavender, Jasmine, Ylang Ylang, Geranium, Mandarin, Palmarosa, Lime --- Have a romantic night planned? Use this to set the mood and have your senses fall into the floral and sensual scent of paradise. ? Mellow Mind: Rose, Lemon, Marjoram, Mandarin, Frankincense, Geranium --- Looking to relax, and unwind from the daily stresses of life? Set this oil in the diffuser, and enjoy this scent with a calm sense of pure bliss. ? Health Guard: Lavender, Rosemary, Lemon, Clove, Cinnamon, Eucalyptus --- Great to diffuse around the house for your family! ? Breathe Again: Peppermint, Rosemary, Spearmint, Eucalyptus, Lemon, Lavender --- Feeling a bit under the weather? Take a deep whiff of this for and experience a breath of fresh minty air!